How were resisters handled by the courts? How many people went into exile? Were resisters ever granted amnesty? Harold Jordan reports that for many people, the war is not over. A guide to books, videos, websites and curricula. The story of a Vietnam veteran...from warrior to peace and justice advocate. Youth activist Shannon McManimon finds reasons for encouragement and concern in today's youth activism. 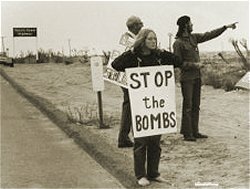 Photo of 1972 protest at Seal Beach, California by Debby Kinsman.